Amtek Precision Engineers is a company renowned for the production of high precision multi-cavity caps and closures injection mould tools and complex CNC components. Committed to the long-term quality of the work we carry out for a varied customer base we recently celebrated our 30th anniversary. And, it’s not just the company that is dedicated to the long-term as many of our highly skilled staff have also reached key milestones. Originally established in 1984, today Amtek Precision Engineers occupies an impressive 21,000 ft2 facility in Totnes, Devon. 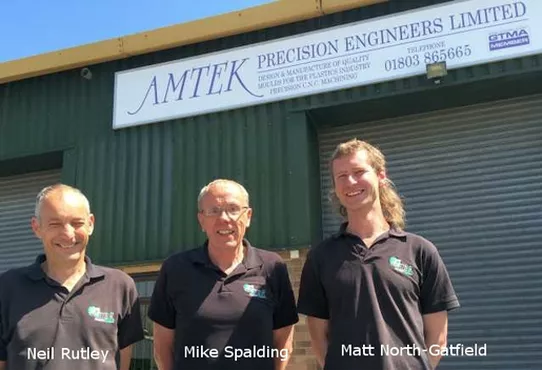 The knowledgeable and enthusiastic staff at the company, many of which have completed toolmaking apprenticeships with local engineering companies, have remained with Amtek, growing with the business. Long service achievers include Neil Rutley, Senior Toolmaker and Design Engineer, with 30 years’ service; Mike Lawes, Production Manager, who celebrates 20 years with Amtek; and the ‘newbies’ Michael Spalding and Matt North-Gatfield, Quality Inspector and Toolmaker & CNC programmer (specialist in milling) respectively, have both completed 10 years’ service with Amtek. Neil Rutley recalls why he chose to work in precision engineering: “When I started in a large company I worked in every section. The last year of my apprenticeship was in the R&D department, which meant I spent most of my time in the toolroom, some years later when they closed the R&D section I decided to find a new job as a toolmaker, and to this day I am proud to call myself a toolmaker. The move from manual machining to CNC is also noted by Matt North-Gatfield, “there were no CNC machines at my first engineering company” he says. He also points to newer and better cutting tool technology, while Michael Spalding is keen to highlight the advantages of machine tool technology and software. “Spark erosion has allowed intricate shapes not previously possible and CAD/CAM software permits flowing curves instead of simple geometric shapes,” he states.